The Sovaris Aerospace team of Michael A. Schmidt, Thomas J. Goodwin, and Caleb M. Schmidt recently published the textbook chapter Pharmacogenomics in Spaceflight: A Foundation of Personalized Medicine in Astronauts. This was published in the Handbook of Space Pharmaceuticals. 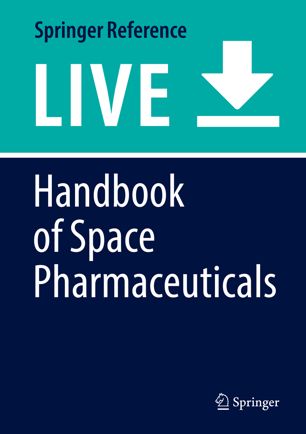 The two-volume handbook, directed at medical professionals who are involved in advancing human spaceflight, covers current pharmaceutical knowledge about the difference in medication efficacy in space versus on Earth and includes trial results and best practices for the space industry. Existing pharmacological research from space is thoroughly covered in this book and Earth applications are also described. Potential pharmacological solutions are posed, along with the known challenges and examples from existing studies, which are detailed at length. This major reference work is the most comprehensive medical resource of its kind in the field. Pharmacogenomics is the study of how genes influence an individual’s response to medication. By extension, pharmacogenomics is the precise analysis of gene variants that influence the regulation of drug metabolism and the attendant development of therapeutic strategies. Whereas traditional pharmacokinetics and pharmacodynamics are applied to populations in order to understand the range of a drug’s effects, pharmacogenomics can be used to personalize drug therapy to an individual. In short, pharmacogenomics represents an emergent method available to tailor drug therapy to the individual astronaut, so that the drug countermeasure solution optimizes the chance for benefit (efficacy), while minimizing the chance for adverse events (safety). While the application of pharmacogenomics is progressing on Earth, there is presently almost no application of pharmacogenomics in space. This represents a substantial gap in our capability, but it also represents an opportunity to better enable humans to thrive in the space environment. The present review explores the fundamentals of pharmacogenomics, which includes examination of the genetic variants of the primary drug-metabolizing enzymes. It next briefly summarizes the limited evidence for how the space condition may influence these systems. The pharmacogenomic implications of the current International Space Station drug list are explored by example. A hypothetical design reference mission is proposed to illustrate how pharmacogenomics might be employed in the space environment. In general, we highlight how the application of intelligent clinical pharmacogenomics to astronauts can be used to guide the use of pharmaceuticals in space today, while the much-needed prospective pharmacogenomic research is conducted in parallel. The authors would like to thank Dr. Charles Lloyd, Chair of the NASA Institutional Review Board and Associate Director of Strategic Communications for the NASA Human Research Program, for his contribution to the historical analysis of pharmaceutical use in space, conceptual framework review, early manuscript review, and critique of the manuscript. We also thank Dr. Robert M. Hubbard, Ed.D., M.A., M.B.A, Sovaris Aerospace, for illustrations and manuscript editorial support.